No one can set personal bests forever. At some point, you’re going to have PBs at all or most ranking distances, on all of your ergs, and improvement on one distance on one machine will likely force you to focus on that distance on that machine, at the potential cost at capacity on another machine or at other distances. We can’t really get around this. This is why people track both lifetime bests and season bests. However, what we CAN do is get to a point where we’ve done all of the distances...set some good personal markers, and then work to maintain capacity/competence across all distances on all machines while simultaneously working towards marginal improvement on one distance or one machine. At least that’s my goal! There’s always going to be some energy system carryover, so it’s possible to do a little of everything and still see improvement. But it requires a little more patience and smart training/recovery practices. The big distance that drive our improvement is the 2k (4k on bike) as this is what we pace off of. Incremental gains on our 2k/4k allows us to pace faster relative to previous efforts, which helps bring the whole system up. We only have one true 2k progression through the year, but we test several times during the 52-week program (mostly to provide competitive opportunities for newer members to apply the gains from various cycles on a new 2k attempt). Large improvements on the 2k are very hard, even after following a specific progression (unless you are REALLY new). So, how can we approach a 2k test at various time throughout the year with the hope of setting ourselves up for even a slight PB? 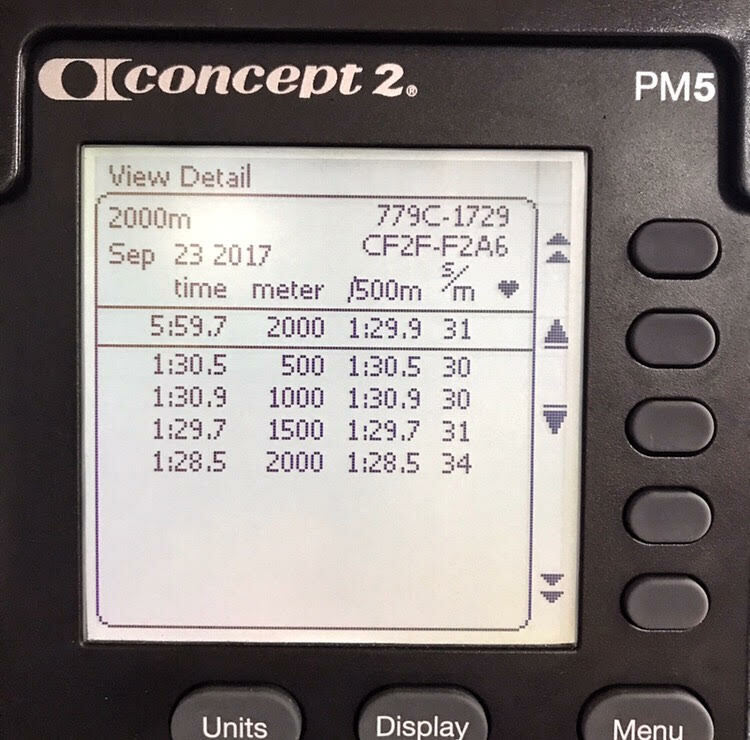 The simplest method I think most people could use to continually and gradually set new PBs (especially in the early years of your erg life) is to row/ski/bike with the goal to flat pace AT or slightly above current PB pace and then hammer the finish to come in faster than PB. It may only get you from a 1:47.5 pace to a 1:46.8....but that’s still a whole split change for pace targets during training moving forward. And that’s enough to drive adaptation further down the road. That’s a small PB and a full split change for training paces. Another thing to think about is taking on a time trial whenever you feel like it. Don’t wait for the program to tell you to do it. If you have it in your head to row a 5k, then row the 5k! One thing to AVOID is pacing off of a GOAL 2k/4k in hopes of fast tracking progress. You would never program a squat cycle off of a goal back squat. You’d get buried. Heck, anyone that has tried “5-3-1” knows you don’t even use your PB back squat...you use 90% of it and program percentages from that. The key? Just be patient. Focus on the progressions that get you excited, choose the sessions that make you happy, play on the machines that mean the most to you, and do the strength work that helps support your training goals. Chase the PBs but don’t define yourself by them. We are all fortunate to have a lifestyle that allows us to enjoy free time and fill it with physical activity, so don’t get too stressed out about numbers on a screen, the speed of improvement, or lack there of. Justin Farina is a CrossFit Level 1 Trainer, and currently a 7x SkiErg World Record Holder in the 4:00, 30:00, 60:00, 2k, 5k, 6k, and 10k. Working as a Coach/Trainer since 2006, Justin has accumulated countless hours of experience working with hundreds of athletes online, in parks, in gyms, on tracks, and in his garage.